Welcome to another installment of SHORT FILM SPOTLIGHT. 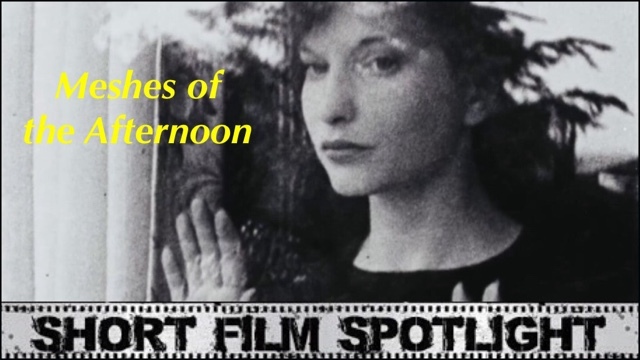 This week I'll be reviewing the 1943 short film, MESHES OF THE AFTERNOON. It is fourteen minutes of confusion and eeriness that explores the blurry line between what's real and what's not. While watching Meshes of the Afternoon I experienced a definite feeling of deja vu, as I was seeing the same images over and over again -- a white flower, a key, and a hooded grim reaper. Seeing the repetition of these symbols throughout the film gave me the distinct feeling that the woman in the film was seeing her own death before it actually happened. I found this short film to be interesting because of its simplicity and use of repeated images such as the knife, flower and a telephone hanging off the hook. This film experiments with angles and editing; which is seen in surrealistic films. I thought this film was mind blowing to the say the least. Deren and her husband wrote and directed this film. It's also been compared to film noir and French Surrealist films from the 1920's. Deren and Hammid wanted to create a film that showed the devastating psychological problems of the human race. They were inspired by Salvador Dalí and Luis Buñuel's Un Chien Andalou (1929) and L'Age d'Or (1930). American film critic James Hoberman said the film was related more to Hollywood film noir than European surrealism. I, however, think Meshes of the Afternoon has elements of both surrealism and film noir. It gave the appearance of a dream like state,mhowever, there was a dark element to it. I've often wondered if the appearance of the Grim Reaper was a predictor of the woman's death, with her death being mysterious in the vein of film noir. Maya Deren and her husband Alexander Hammid portrayed the woman and the man in the film. Deren said the film explored the interior experiences of the individual. I loved Deren's performance; she was so frantic and wonderful to watch on-screen. Hammid's was more understated, but I think the contrast worked well for the film. Meshes of the Afternoon used some very creative editing and unique camera angles as well, which is nice to see from such an old film. So, if you're looking for something a little less mainstream, i recommend giving this film a try.